1 Cost of materials is a charge will be added to the gross expenses to build a new fence if a contractor will purchase and supply all necessary materials at his own discretion for the standard fence installation. If a homeowner has a preference besides material type the final price will be discussed. 3 In the total fencing prices included installation of new fence posts and new fence installation. Demolishing and disposal of an old wood or vinyl fence as well as cleaning the area will add an extra $6 - $11 per linear foot to the final price of fence replacement. But in some cases preparation work will double the gross expenses to get a new fence installed. The area surface condition will be one of the major factors which determine the cost to build a new fence. If it is a hard soil with a rocks or tree roots the price will increase due to time spend on a fence posts installation. 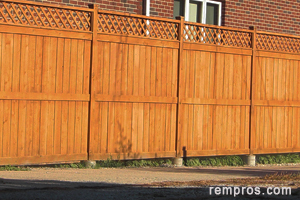 How much does it cost to install a custom made fence? There are endless possibilities in fence designs. If you are planning to incorporate a couple or even a few materials for creating unique fence style the price will be much higher. Custom work cannot be estimated before analyzing the design and how complicated installation of a new fence will be. 4 Average cost of fence installation includes labor cost and materials expenses for standard installation excluding possible preparation work. 5 Difference in cost show what you will save or how much more in % you should expect to pay for different types of fence installation in comparison with a wood fence. How much did you pay for fence installation?